After arrival in Rome, had to call to find our about our transport to our hotel as no one was there for us. We were told he was on his way. After waiting about 30 minutes he arrived and did apologize. We had to walk quite a distance with luggage to where his van was. We were fine but I kept thinking about the elderly and there would be no way that could walk that distance. Not sure why he could not park his van, like others, right outside the door and we could leave from there. He was very nice, but having to wait and then walking such a long distance with a lot of luggage wasn't my expectation. 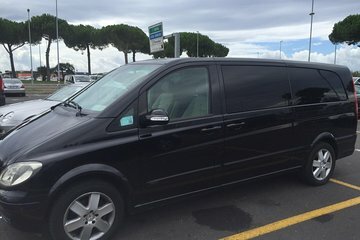 I called 24 hours before leaving Rome to make sure our transportation would be at the hotel as we had to leave our hotel by 6am to catch our flight. Our driver arrived at the hotel and actually was waiting for us when we came downstairs. Perfect! We have used Viator to book transfers several times and will continue! Easy and quick. Would use again. Driver waiting at exit and helpful with bags. It is the best way to arrive in a new city. We were met at baggage claim exactly where we were told and had a great ride to our hotel. It was exactly as we expected. On time, clean and tidy vehicle. However--the ride was advertised as a Mercedes Benz luxury 4-person car, and a van is what arrived. That was a disappointment. A great way to get to the hotel after a long flight. Enjoy the sights. Relax your almost there. excellent service, we were met at the airport on time and efficiently driven to our hotel. We would recommend this service anytime. On time. Good driver. Very comfortable. Used them on our return.